A reader asked me to repost this from December of 2009. I hope it blesses you. Today Christians around the world contemplate the reverence surrounding Christ’s birth. We tell the story of a virgin birth and a manger nursery. We share in the wonder of God in a baby. Tonight, though, I sit touched by a different part of the story. A side of Mary’s story. There are so many sides to her story, but this side really speaks to me. While I can’t suppose to know how Mary actually felt, I have been great with child six times. I think I can guess some of it. Mary demonstrates great faith. We often talk about the faith she showed when the angel of the LORD brought the news that she would carry the Messiah. We talk about the faith she displayed when the shepherds came to see the baby. 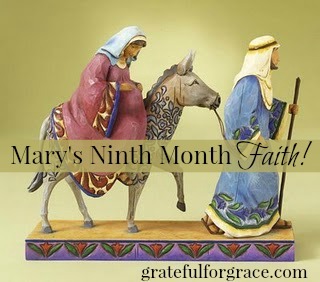 We talk of the faith she had when the magi came to worship the Savior. I want to talk about the faith she showed loudly and clearly to me. Truly, to all women who have or want to carry a child. I want to talk of the faith Mary shows in her ninth month. To me, it starts when Joseph declares he and his very pregnant betrothed will travel to Bethlehem, sixty-five miles away. That’s a three day journey, people! A three day journey with camping as the most likely option for night time stops. She could have gotten out of it, but she didn’t. Do you see the faith that took? Let me tell you, when I’m in the ninth month, I’m not going camping. I’m certainly not walking three days. Don’t even think about putting me on a donkey. Seriously, I can’t even imagine the sciatica issues involved. Or pain that would make me think the baby was going to fall right out. Or the attempts to breathe while my lungs are squished. Or the tears. Mary goes with her betrothed. It is possible…she complained some. Maybe she rolled her eyes. Or sighed loudly. I don’t know. BUT she went. I know that. I’m admitting right here for all of you that this woman would have played the “I’m about to have the baby and three days on the open road will guarantee I will and there is no midwife I know en route or in Bethlehem and my mama is here so I’m sure there is a loophole for women great with child” Card. Guar.an.tee it. My faith would have been in the typical and the predictable category. Not in the astounding and the surprising. Mary goes with her betrothed. She walks. She rides the donkey. She fixes meals. She takes a portable layette of swaddling clothes and who knows what else. She goes. Her faith in taking such a journey in her ninth month speaks volumes to me. She is fully relying on God. For her delivery. For the birth of her baby. For the biggest moment of her life. Mary’s life displays great faith: from the moment angel spoke to her, to the moment her Son ascends to the Father. And tucked in those astounding years is her ninth month with Jesus in her womb. A part of the story that touches my heart and convicts my spirit. Tonight, I think about the faith it took to get her to Bethlehem. Of the faith it required to give her a peaceful delivery in a stable. Of the faith she had in God for her ninth month. A ninth month like no other. Leading to a birth like no other. Displaying faith like no other. I’m very grateful to know a small part of the faith Mary displayed in her ninth month. I’ve even more grateful to personally know, worship and love the God that gave her such a gift and who is more than worthy of being the object of such life changing faith. Next post: Free Six Month Bible Reading Plan: Join Me?